I've known about the "Force Beam" lightsaber -- more info at the swca -- but I can't find any information on this "Light Beam" variation. My first thought was that they changed the name from "Force" to "Light" to avoid law suits. But now I'm wondering if this one might have come first -- the line "The Force is With You" and the much more SW-style logo seem like giant targets for Lucas' legal guns. So now I'm just confused. 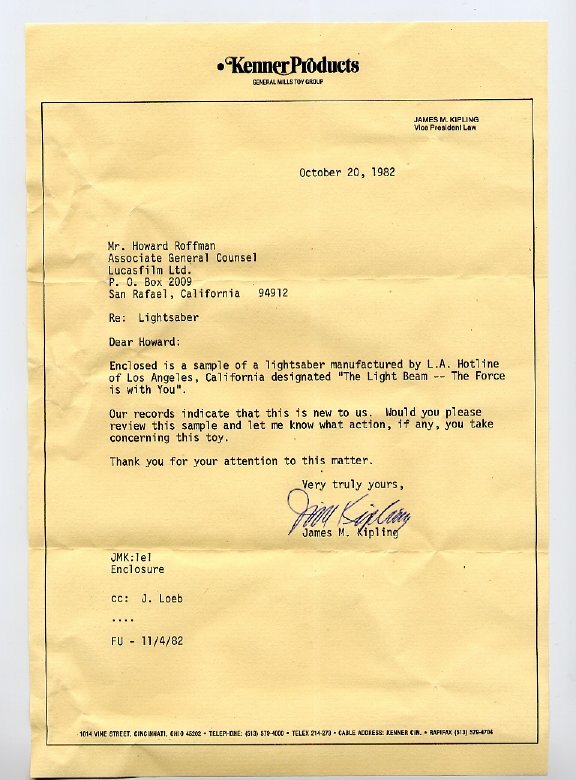 The Light Beam saber is manufactured by the Moon-Lite Co., of Los Angeles, CA. The Force Beam is "distributed" by Jack A. Levin & Associates, also of Los Angeles. The zip codes for both companies is one digit off -- so I'm guessing they're pretty close to each other. And most importantly... does anyone have an extra Force- or Light Beam blade they can sell me? I was under the impression that the "Light Beam" was the Canadian Version of "The Force" saber. Best guess is that the Force Beam received a Cease and Desist order and renamed itself to the light beam. I was under the same impression as Mike, I thought the name change was,and no I don't have a light beam, just a force beam,so far. Thanks, guys. So is this the first documented example of a U.S. version of this saber? I'm surprised... I would have thought one would pop up before now. It's also really interesting to me that the U.S. manufacturer -- who almost has to be the same for both versions -- would partner with two different companies in two different countries for the different versions of the toy. I know there's advertising out there for the British version of the Force Beam saber -- there's a link embedded in the SWCA post -- but has anyone ever seen any ads for the Canadian version? Neat piece. Nice to see what it looks like. It appears as though the manufacturers -- or the name the manufacturer is operating under -- is different, though. The letter says that the company is "L.A. Hotline," while mine says "Moon-Lite" company... And the Canadian one is different altogether! Also, it's interesting that a bootleg in '82 would copy the SW logo. And where does the Force Beam fit into all of this? If it was coming out in 1977-78, does that mean this bootleg saber -- under various names -- was being produced for five years before finally coming to the lawyers' attention? Or was there a pause in production and then, in the Eighties, the guy tried to sell it again? I guess the latter would be more likely. I love that, despite the amount of research and documentation all the SW collectors have contributed to the hobby over multiple decades, there are still mysteries to uncover. No info to add...but the Canadian version was manufactured 10 blocks from my house. That makes your house all the more collectible. The Canadian one was sold at Zellers stores here in Ontario when I was a kid but that is no suprise as they also sold pirated Atari 2600 games. My Cousin and I both got our sabers from Zellers and we got alot of those pirate 2600 games too.